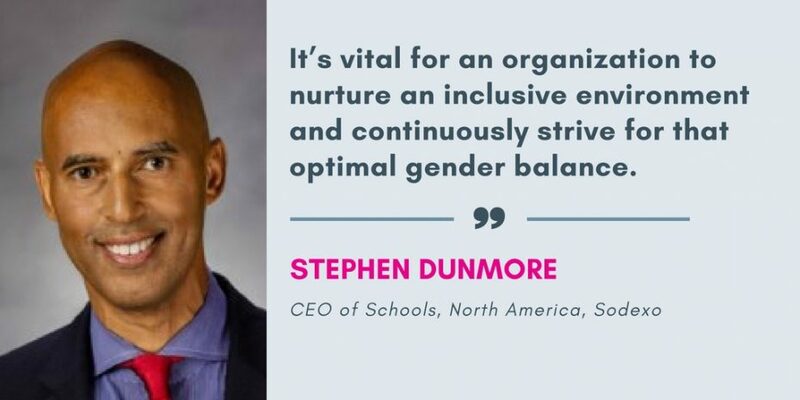 Stephen Dunmore is CEO of Schools, North America, for Sodexo. 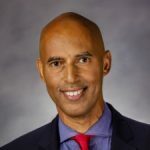 He leads the Schools team to provide student well-being solutions and support student achievement at nearly 500 public school districts in North America. Male leaders can drive gender equality in executive leadership roles by proactively advocating for women leaders in their organizations. As recently noted in Sodexo’s 2016 Diversity report, women account for 45% of the S&P 500 labor force, yet still only represent about 25% of executive/senior-level managers, and 4% of CEOs. Here’s another important statistic. McKinsey & Company compared the financial performance of companies with a significant number of women in top management to those without women in top roles. The companies with the highest number of women leaders had the best performance, averaging 41% higher ROE. These numbers make a compelling case for more, that is, more focus on recruiting and retaining women and most importantly – more understanding and recognition of the unique capabilities women bring to the table. I think back to key early career experiences at a Fortune 500 company, where female representation was low overall and the higher the managerial positions, the fewer number of women were represented. There was also a lack of cultural diversity which in my view adversely impacted the results and performance culture of the company. At Sodexo, we’ve found a key factor in recruiting, retaining and ultimately advancing women into leadership roles comes back to creating an inclusive culture designed for everyone to reach their full potential. This includes providing the tools that allow all employees particularly women, to enjoy equal access at every step of their advancement. Another key success factor has been achieving the right gender balance in our teams at all levels throughout our organization. It’s vital for an organization to nurture an inclusive environment and continuously strive for that optimal gender balance. We’ve made great progress in gender balance and like any other area, we can always do more and we must grow. Our business depends on it. It is critical that a diverse and inclusive team mirrors the clients it serves. This gives the organization a unique advantage in the marketplace and which leads to key innovations for the business. 1) Proactively seek opportunities to advocate for change and break down barriers for the women in your organization. My goal throughout my career, and especially as CEO, has been to identify women leaders and advocate for them by articulating their unique skills and capabilities to key decision makers. It’s human nature to gravitate towards individuals of similar likeness and in certain male dominated industries – that easily becomes the case. 2) Sponsor qualified women leaders in your organization and networks. It’s important for male decision makers to endorse women and put a spotlight on their contributions to help give them a voice. Bring the conversation back to those female contributors. 3) Support organizations focused on developing women leaders, both internal and external to your organization. For example I’m an active board member of the Women’s Food Service Forum, focused on leadership development of women in the food service industry.